February | 2010 | My name is Kervie and I'm not here to make sense. What a night to be a member of the Pyxl team last Saturday as we ventured out downtown for the 45th Annual Addy Awards, presented by the American Advertising Federation of Knoxville. Just in case you missed the festivities, it was a fun night filled with great music, great food, great friends and great work by very talented agencies in Knoxville. 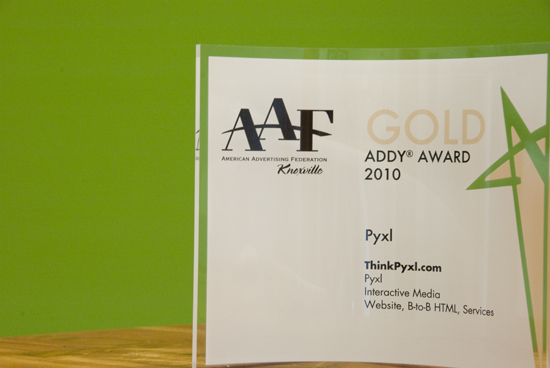 The main highlight of the evening came when we were announced as a Gold Addy recipient for our website, thinkpyxl.com. What a shock! What surprise! What an accomplishment! Our team is very proud of our site since it’s a major cornerstone establishing Pyxl as a brand new digital company! As if winning a Gold Addy is not enough excitement, the inner craziness and euphoria prompted half of our team to do shots at the liquor luge at the event as an initial celebratory event. We even caught it on camera (but we have to get releases from the guilty party first). Even though we only had 4 entries, we were very happy to receive an award nod for all of them. As Pyxl grows, we plan on submitting more entries in the future. All of the Gold and Silver Addy award winners will go on to compete on the regional level and if successful, will move on to the national Addy Awards show. So congrats to all the other winners, and good luck in the next level. There were a handful of companies involved in putting together the awards show and Pyxl was in the forefront, spear-heading the Social Media effort to get the word out on up-coming AdFed events. We even set-up a live stream site to be seen by all at the banquet. It was great to see people’s interaction online as awards were mentioned and the crowd’s random musings throughout the evening. Also, one thing that I enjoyed is the camaraderie between fellow designers and other people in the industry. Overall, we are very pleased at the outcome and look forward to another year of creating beautiful design and marketing projects for our clients. 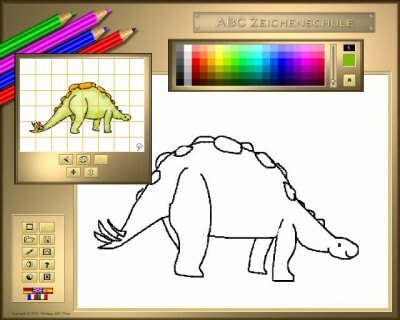 No, it’s not.. “I wish I learned how to draw a dinosaur with Microsoft Paint” or something like that. This is a list of mostly things that I’ve experienced during my short time being a professional graphic designer. I got a lot more of things to learn but here’s a quick rundown. 1. Most of my work will not be critiqued by other designers. When a non-designer critiques a design, they are generally less informed about the design process and techniques as they lack the background a designer has. Because of this, they often aren’t able to effectivly communicate the message as a designer would. 2. You usually don’t have a full week to concept, develop and execute a great design. During the work week, there’s a lot of “emergency” projects that needs to be turned around almost immediately. With a full plate of other design projects, limited time is spent on certain things and usually the small details suffer. 3. Put more emphasis on web design because print will almost be dead within 10 years. Getting the correct training to be prepared for the ever-changing landscape of design is very important. I am glad I have my background in print, since it helped me with my transition from going from a 95% print: 5% web designer to 90% web: 10% print in a year. 4. Social Media will show how many “non-designer” people with a copy of Adobe Suite will make all designers cringe at the sight of really ugly designs. Design school was a very hard-nosed competitive program. Everyone wanted to show-off their designs skills and everyone kept design secrets and resources to themselves. But in today’s world of design, it seems that camaraderie between other designers are more typical. Any other set of eyes that can critique a mundane project with the most boring subject and give it a practical solution can be the difference between a disaster or a successful project. 6. Business and marketing classes should had been a program pre-requisite. Interacting with clients is best way to understand and manage your projects. Learning about pricing, marketing strategy, markups, budgets on time and money, etc… will go a long way in sufficiently handling every aspect of the projects. 7. Web development and programming languages. 8. It’s rare that you get to design some really cool stuff with really cool subjects with no intended demographic. If your base clients are Nike, MTV, Comedy Central, Quicksilver, ESPN etc.. then most of the creative can be abstract and brilliant eye candy. But what if your clients are government agencies, suit and tie buttoned-up high-tech companies, and rustic furniture re-sellers – those brilliant and edgy design ideas are pretty much put on the shelves. 9. How about a Pre-Press class for 1 solid semester? Beside designing that awesome 125-page magazine from top to bottom, and yes, including the ads. We have to always be a couple steps ahead to make sure no headaches happen when you package that final file and send the files over to the printers. I learned a lot of technical things from my favorite printers and none of them ever existed in the realm of the design studio lingo. So even though the design world has somewhat abandoned the print path for the cheaper and easier-fixed web design projects – knowledge of the print process should still be a major arsenal in your post-production skills. 10. You will spend more time with the people you work with than your actual real family. I am very very glad that I enjoy working with the people at Pyxl. They are all open-minded, have a great sense of humor, hard-working, understanding, crazy, smart, innovative, creative so on and so forth. They’re pretty much my default second family. But if you dread going to work everyday, then your work suffers as well. Your co-workers should be a great asset to your design development as they give you a different perspective in finding a solution in areas you’re not an expert in. So better be nice to all of them. Maybe buy them lunch or a round of drinks during happy hour – or just be nice.